The Avg. Group Discount is 21.2%! This hotel was amazing. The staff was accommodating to our students. It was very clean and the breakfast had a garden variety choices. I would recommend this hotel to everyone. 19-Jul-2018 Verified Review, stayed from Mon Jul 16 to Fri Jul 20 2018 at a $137.00 group rate (15% discount). 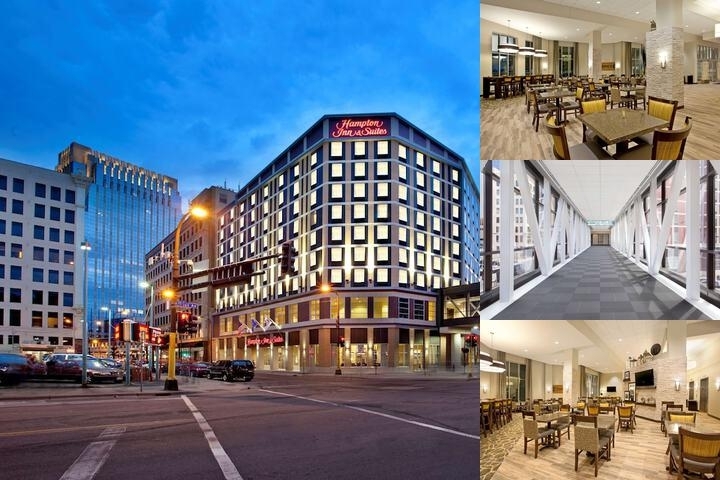 Situated in the heart of downtown Minneapolis, the newly built Hampton Inn & Suites Minneapolis/Downtown hotel in MN is close to the art and business district, and several Minneapolis colleges and universities, including the University of Minnesota: Twin Cities. We are connected to the city's iconic climate-controlled Skyway, placing us minutes from the Convention Center, Hennepin Avenue, Nicollet Mall, amazing restaurants, and vibrant nightlife.This downtown Minneapolis hotel is within walking distance of Target Field – home of the Minnesota Twins and Target Center - home of the Minnesota Timberwolves. We are also just one mile from U.S. Bank Stadium, the new home of the Minnesota Vikings as well as less than three blocks from the revolutionary Hiawatha Light Rail Line, providing easy connectivity to the MSP International Airport and the Mall of America. A short stroll to the Mississippi River waterfront takes you to the Mill District – a historical area featuring fine dining, gorgeous parks, striking views of Saint Anthony Falls, and walking and bike paths.Take in city views from your contemporary guest room or suite, and enjoy free WiFi, a large desk, a spacious bathroom and a clean and fresh Hampton bed®. Energize with state-of-the-art equipment in the 24-hour fitness center. The hotel has a free 24-hour business center and a modern meeting room, large enough to accommodate up to 50 people. Purchase snacks and sundries in the 24-hour Suite Shop. Local Shuttle Info: No local shuttle but work with several locally for a fee. Free hot breakfast buffet and hotel offers room service via Rock Bottom from 10am - 10pm daily. 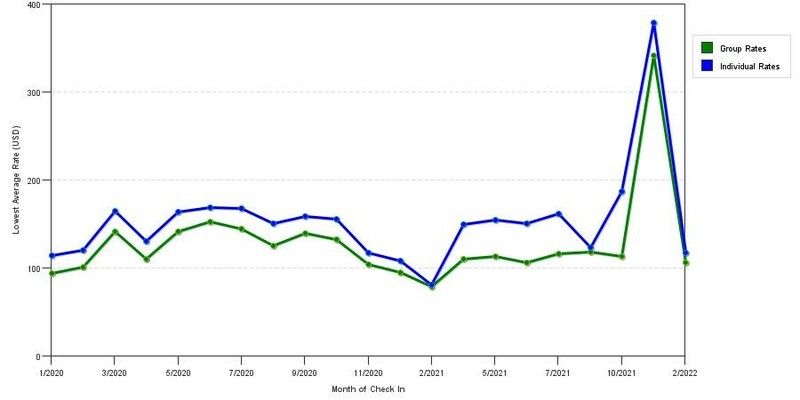 The graph above is seasonality of room rates for both our group prices and the lowest online individual rates our rate checker could find at the time the group/meeting offer was submitted. The best group/meeting discount shown is 26.8% in March 2017 and the highest average individual rate is $181 in the month of July 2019. This chart will show past seasonality and also project future months. If you are flexible with dates, you may want to consider staying at Hampton Inn & Suites Minneapolis / Downtown in a month when rates are lower. Below are the meeting, banquet, conference and event spaces at Hampton Inn & Suites Minneapolis / Downtown. Feel free to use the Hampton Inn & Suites Minneapolis / Downtown meeting space capacities chart below to help in your event planning. Hotel Planner specializes in Minneapolis event planning for sleeping rooms and meeting space for corporate events, weddings, parties, conventions, negotiated rates and trade shows.